Art exhibitions, film screenings, rum tastings, cultural performances, and culinary presentations, are just a few reasons why you should join The 3rd Annual Afro-LatinoÂ Festival of New York, from Friday, July 10 thru Sunday, July 12. The festival celebrates the contributions that people of African, Latin-American and Caribbean cultures have made to New York City and the world as a whole. On Friday the festival kicks off in Harlem, N.Y.,Â with a cocktail reception, an awards presentation, a digital empowerment session, and several performances, then on Saturday the festival moves to Bushwick, Brooklyn, to host a series of AfrolatinTalks. The festival makes it’s final debut on Sunday in Brooklyn with a street fair and live concerts. Amanda Alcantara, a writer, journalist, and community organizer, will host the Afro-Latino Festival Opening Gala on July 10, and television producer, writer, director, Kadine Anckle will host the event’s festivities on July 11-12. The live concert includes performances byÂ Chop and Quench, The Fela! Band (New York), Cultura ProfÃ©tica (Puerto Rico), Les Nubians Cameroon (France/NYC), Danay Suarez (Cuba), and Kafu Banton (PanamÃ¡), Los Gaiteros de San Jacinto (Colombia), and many more. 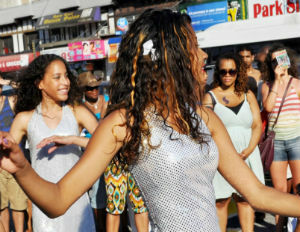 The festival commemorates the International Decade for People of African Descent, declared by the U.N (2015-2024) and its principles of “justice,” “recognition” and “development.” According to the website, the mission of the annual festival is to provide a networking space to pay tribute to the African roots of people from Latin America and the Caribbean. Tickets start at just $30. Visit Afro-Latino Festival to learn more.